"Since its discovery at the end of last century, dark energy has been a riddle wrapped in an enigma," said Bob Nichol, Director of the Institute of Cosmology and Gravitation (ICG) at the University of Portsmouth. "We are all desperate to gain some greater insight into its characteristics and origin. Such work helps us make progress in solving this 21st Century mystery." An international research team, including astronomers from the University of Portsmouth, has revealed evidence of dynamical dark energy. The discovery, recently published in the journal Nature Astronomy, found that the nature of dark energy may not be the cosmological constant introduced by Albert Einstein 100 years ago, which is crucial for the study of dark energy. Lead author of the study Professor Gong-Bo Zhao, from the Institute of Cosmology and Gravitation (ICG) at the University of Portsmouth and the National Astronomical Observatories of China (NAOC), said: "We are excited to see that current observations are able to probe the dynamics of dark energy at this level, and we hope that future observations will confirm what we see today." In 2016, a team within the SDSS-III (BOSS) collaboration led by Professor Zhao performed a successful measurement of the Baryonic Acoustic Oscillations (BAO) at multiple cosmic epochs with a high precision. Based on this measurement and a method developed by Professor Zhao for dark energy studies, the team found an evidence of dynamical dark energy at a significance level of 3.5 sigma. This suggests that the nature of dark energy may not be the vacuum energy, but some kind of dynamical field, especially for the quintom model of dark energy whose EoS varies with time and crosses the -1 boundary during evolution, according to NAOC. In the next five to ten years, the world largest galaxy surveys will provide observables which may be key to unveil the mystery of dark energy. The new study was supported by the National Natural Science Foundation of China (NSFC), Chinese Academy of Sciences and a Royal Society Newton Advanced Fellowship. Nichol added: "This work is the culmination of many years of work in collaboration between scientists in China and the UK. Gong-Bo is one of our brightest stars holding a joint position between NAOC and here at the ICG." 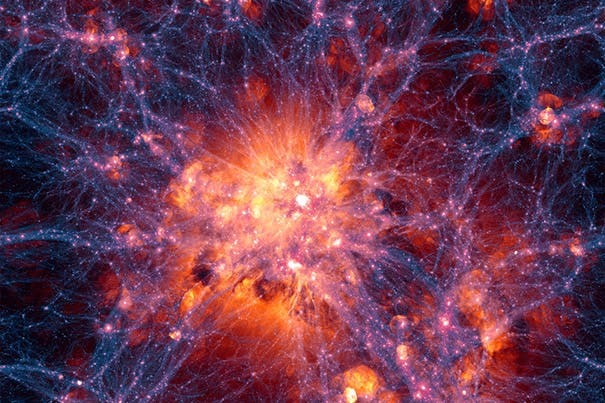 Image Credit: courtesy of Illustris Collaboration –the first realistic virtual universe using a computer simulation called Illustris. Illustris can re-create 13 billion years of cosmic evolution in a cube 350 million light-years on a side with unprecedented resolution.